Marquetry and inlay are two distinct decorative techniques used extensively in Georgian furniture design. Both techniques use veneers to add decorative elements to the surfaces of various types of furniture. Veneers are thin sheets of wood which are often glued to a ‘core’ panel to give a surface greater visual appeal. 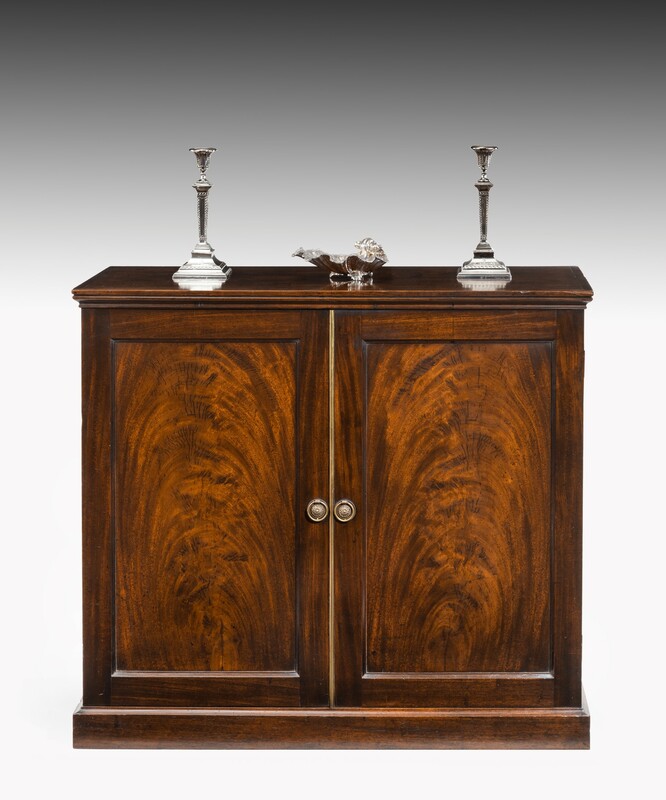 On the Georgian cabinet pictured below, the flame mahogany veneeres are a wonderful addition to the piece. In the cases of marquetery and inlay, veneers are cut into smaller decorative shapes and assembled onto furniture surfaces to serve as decoration. Though they share certain characteristics in their method of production, marquetry and inlay differ from one another in their application. Marquetry is the technique of applying sections of veneer to a whole surface, creating patterns and motifs with different woods, with contrasting grain or complementary tones. 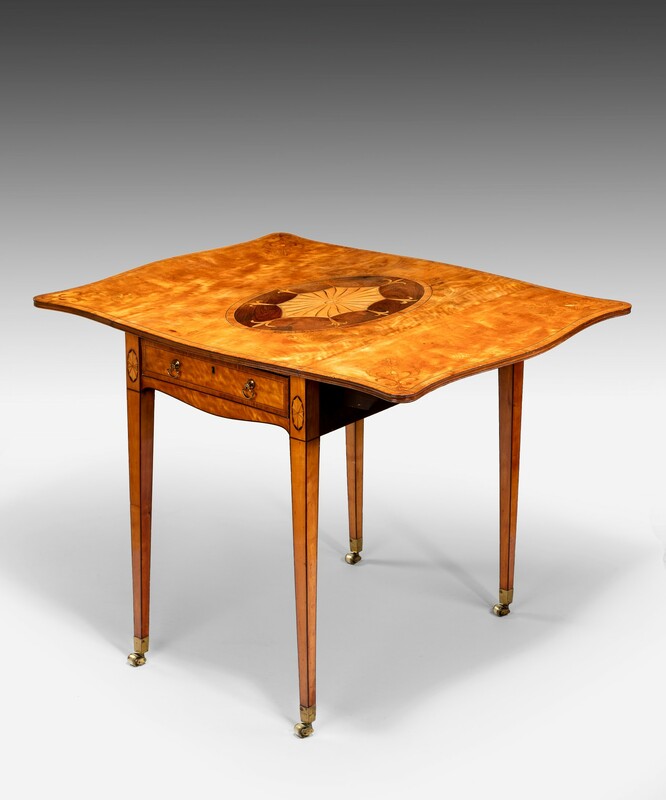 Often, the veneers were cut together to form repeating patterns of the same shape, but decorative marquetry can also include depictions of nature or classical motifs such as the patera depicted on the pembroke table below. Similarly, parquetry is the use of geometric shapes cut from veneers and repeated to create a pattern on an entire surface. 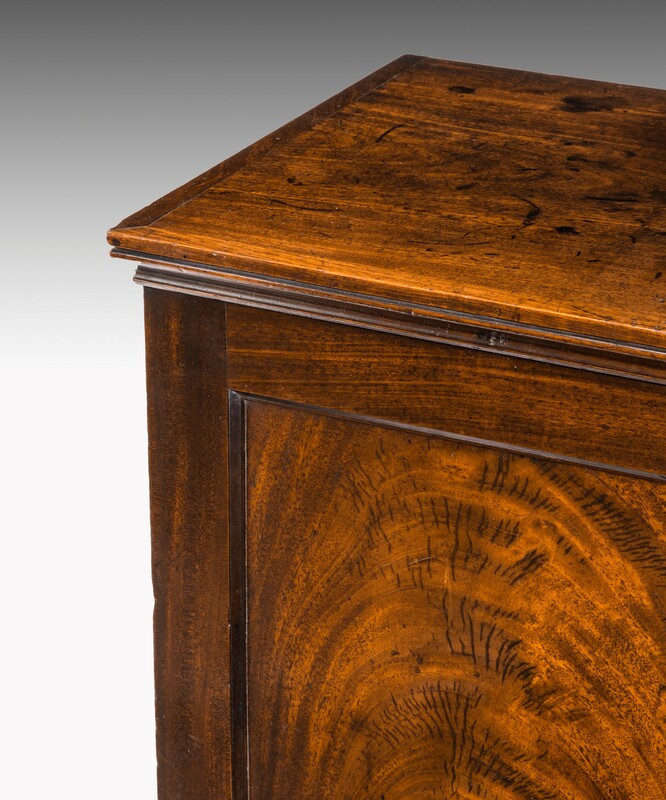 Though it is now predominantly used in flooring, it was use in furniture making during the eighteenth century. 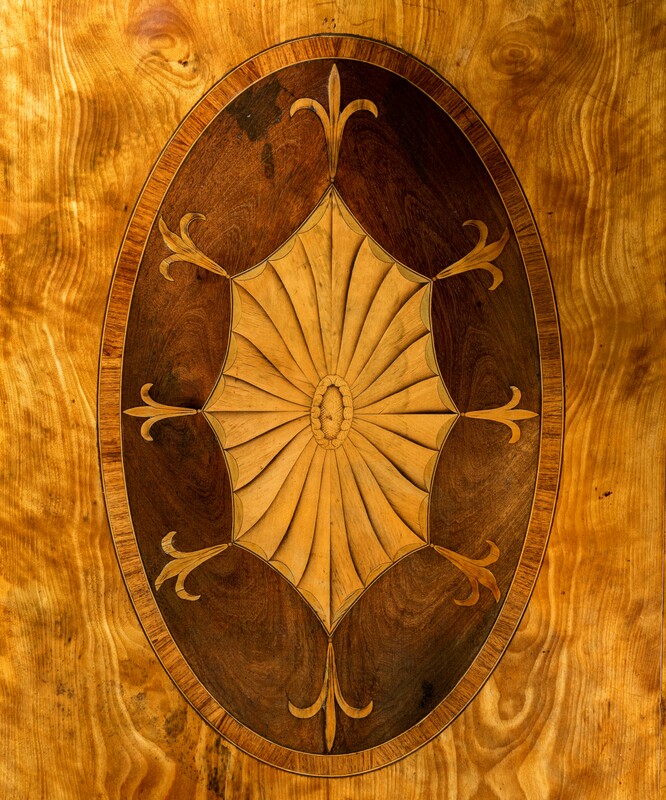 Inlay differs from marquetry in the use of materials and application of veneers. To create inlay, decorations are precisely cut and are placed into recesses cut into the base material of the piece. Contrasting types of wood are commonly used to create the decorative sections, but materials such as ivory, mother-of-pearl and marble are also used for their visual qualities. 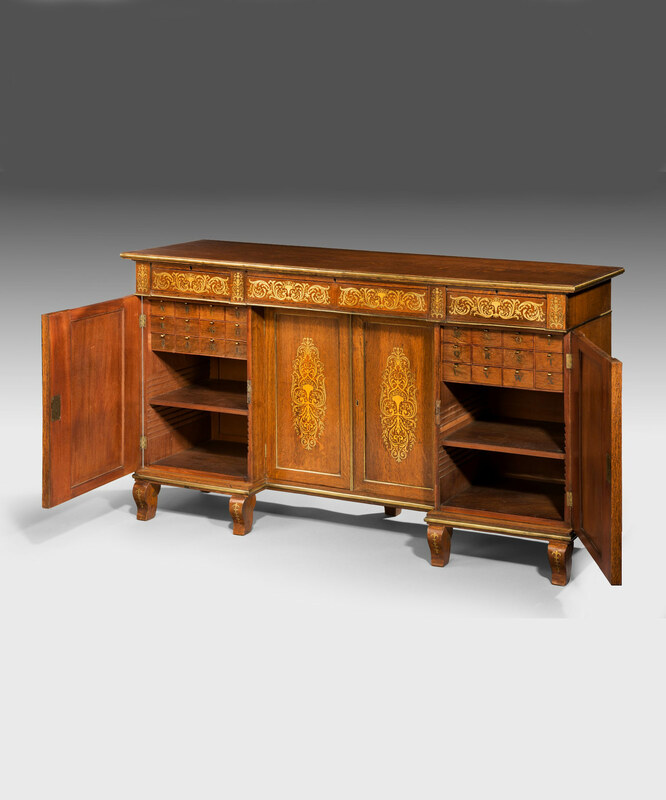 Below are two images of a Regency oak veneered chiffonier with brass inlay recently sold from Reindeer Antiques. 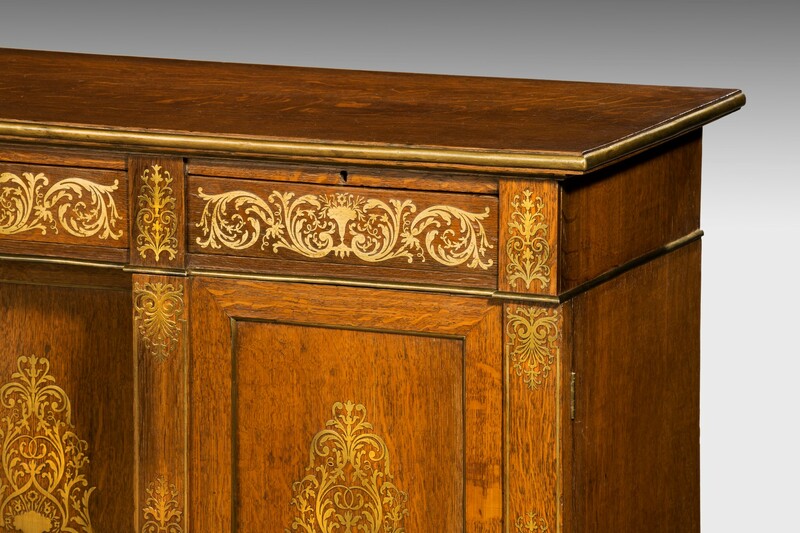 Some of the most well renowned examples of inlay are work of the eighteenth-century French cabinetmaker Andre-Charles Boulle, known as Boulle work. Boulle inlaid brass into tortoiseshell to create veneers to apply to furniture.